More than a screen protector that protects against scratches and falls, this tempered glass acts as a touchscreen extender. That means it magically moves functions from the screen’s top corners to the bottom—on either side of the home button. Those invisible buttons are easily within thumbs’ reach. Now using your iPhone with one hand is no problem. In order to tap the top option buttons (in order to go back or edit for most cases) with just one hand, you can just double-tap the home button and the entire screen will move down for you to tap the top menu without having to change your holding position. Obviously, you double-tap the home button again to move the screen back to normal mode. Even in my slim elago plastic case, the invisible buttons works reliably. However, I've noticed diminished response on the upper corners of the screen where the invisible buttons are linked. So, I either have had to press repeatedly or switch over to the invisible buttons if all else fails. Also, since this is my first glass cover, I realized that the cover can crack (and has cracked) from impacts that didn't affect my previous plastic covers. It's also thicker than my previous covers so there's more of a lip between the home button and the screen. It worked, buttons bright down, BUT, it also blocked other operations too. Took it off after 3 days!!! Gain something, lose something!!! Not, lose something!!! No more overstretching your thumbs. This touchscreen extender lets you access functions from the bottom of your phone instead of the top. The tempered glass screen protector creates invisible buttons on your iPhone by adding a touch-sensitive layer on top of the screen. Those buttons transport functions from the upper corners of the screen down to one on each side of the home button—just by tapping the white space. Now any app you use that has those top buttons—like email, Instagram, or notes—is much simpler to use. Your hand creates the conductivity that powers the touch sensitive technology, so you need to be holding your phone for it to work. On top of the invisible button magic, an Olephobic coating helps prevent fingerprint smudges, and the glass is scratch-resistant. 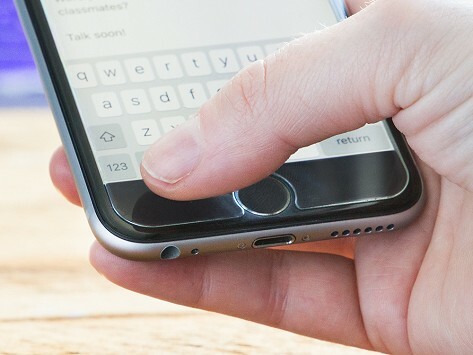 It’s easier to use your iPhone—especially one-handed—with the functions you want easily within thumbs’ reach.